“You are not obligated to win. You are obligated to keep trying. To the best you can do every day.” – As quoted by Jason Mraz. 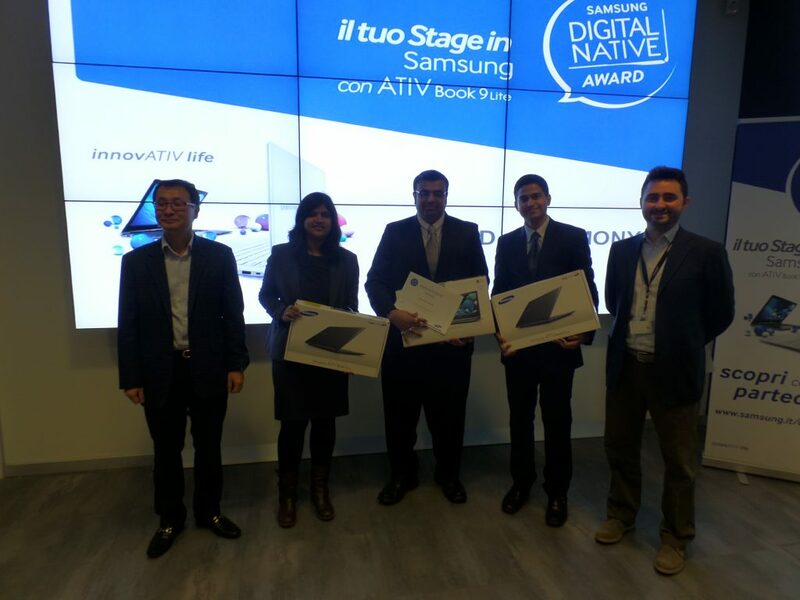 After lot of practice, group discussion, changes and continuous rehearsals at dorms, university finally 27th November 2013 one of the best days in my life were all efforts paid off – FINALIST OF SAMSUNG DIGITAL NATIVE AWARD- ITALY . The best part was being a visitor to the Country and winning a 2nd position in a National competition out of 180 teams. I am so pleased to come runners up in this. Receiving this is such an amazing honor! I could not have done it without Professor. Paolo Guenzi, My team members – Rakhi and Parag, all who participated in our survey all the faculties’ members who have taught and built in my foundation. Most importantly thank you MISB Bocconi and Samsung for giving such a big platform and everyone else in my life who made this moment possible for me. It is an experience to remember, at the outset, I thought it will be an uphill task to win as we had to analyse Italian market and make promotional plans in this country without access to market data or any paid reports. This contest has given me confidence that I am ready in any project in any part of the world with limited resources as a strong foundation has been laid in MISB. Having studied in 3 different continents America, Europe and ASIA, I can say am truly a GLOBAL MBA. Perusing your passion and being passionate about it leads you to victory. Teamwork is one of the best approach we get in new ideas, different perspectives, ways to solve a problem, create something innovative, viable and valuable. Team’s success depends on complimentary skills, though we all had good background in marketing only however strengths of each person in team were different and we worked on our strengths. Be enthusiastic; open to everyone’s perspective, meet in people – members, friends, faculty etc. Communicate with them; ask them for their opinions, feedback, and support. Each one of them has something important to contribute. Our thoughts become action we attract what we think and desire. Above all, our intensity, focus and dedication were the 3 major reasons why we went so far in this contest. I remember spending 5th nov night on airport as my flight back to Milan was early morning. 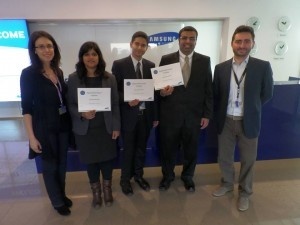 Sleepless and tired as I was but still that day after lectures we sat to do our work on Samsung project. Parag cancelled his trip to Florence as we were lagging behind our original plan. Rakhi was not in town on the day of submission but her heart was in the project though she was on vacation. Most importantly, got an exposure on how in real time a company formulates marketing strategies, market their product and works towards its success.